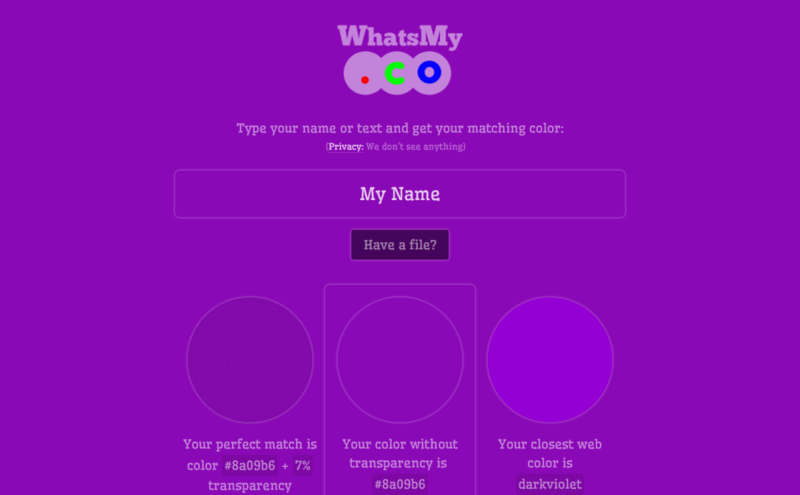 WhatsMyCo Type your name or text and get your matching color! A fun way to discover colors! Type your own name. Or any name, title, quote, sentence. Or even upload files. And get a matching color. A fun and personal way to discover and share beautiful colors, or inspiration for any task that requires color. Turn words you love into colors you love. Use them to breath new life into your Internet persona and online presence. It's easy to copy the colors and their codes, and even use them as profile photos, or as beautiful modern wallpapers. With the Share on Facebook button, it's an easy task to post your favorite color on your Facebook profile. There is nothing to install. All you need is a modern browser running on any PC, notebook, tablet, or smartphone. WhatsMyCo is a pretty interesting concept. ... Is this website useful? I doubt it. Is it fun? It sure is. Maybe you can use it to give your wedding card a personal touch: just combine your color with that of your partner.